Sail ships have a very immediate and obvious advantage over other vessels. Windpower is clean, easy to transport (no heavy fuel to transport) and has no emissions. Although we cannot use sailpower all the time the sails are not just there to look good, we always try to maximise the amount of time we are under wind power. Sailing versus a motor cruising means substantially lower fuel consumption and emissions. Using a figure of 60% average power coming from wind energy saves 1,839 gallons (6960 litres) per day. That ammounts to a reduction of 671,000 gallons (2.54 million litres) per ship per year. When the ships do consume fuel, it is a less polluting grade. The vessels only utilize very pure high-quality low-sulphur gas oil; for this we were awarded the International Air Pollution Prevention Certificate. International Maritime Organization regulations under Annex V1 limited sulphur content in marine fuels to 4.5% in July 2010 and to 3.5% on January 1st 2012. The high-grade marine gas oil, with less than 0.1% sulphur content which these vessels already use more than complies with international regulations. This means a reduction of sulphur by 45 times less than the prevailing environmental regulation. The ships are equipped with small low power, energy efficient caterpillar engines whose performance far exceeds the new requirements imposed by the international maritime organisation. The engines on the ships also are designed to exceed new regulations on exhaust gas emissions. 2) we never dump dirty or ‘grey’ water into the oceans. Thanks to advance treatment systems the only water we release is thoroughly sanitised and non-polluting. Only eco-friendly , biodegradable products are used for cleaning onboard the vessels. Super concentrated formulae that employ innovative packaging and dispensing methods are chosen to optimize usage and minimize waste. The on board swimming pools are filled with seawater, reducing chemical usage and the need for clean fresh water. The final link in the shipboard 'green' programme is ongoing crew training to raise environmental awareness, ensure best practices and compliance with all applicable rules and regulations. Medium to large cruise ships are very much bound to the ports designed to handle large numbers of passengers and large ships. 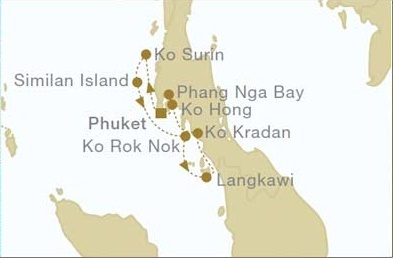 These ports are often far apart and involve long days at sea between ports. The beauty of small ships is that they have access to so many more destinations. This in turn means that the benefit of tourism are spread between the smaller islands and communities that we visit. These communities can enjoy some of the benefits of tourism, regular visits by small groups rather than occasional large influxes that swamp the community. We encourage our to learn a little about the culture of the places we visit, and even to learn a few words of the local language, as that will make interaction with the residents much easier and more pleasant for both sides. We also encourage our passengers to try some of the local produce when ashore, perhaps trying a local fruit drink instead of a tin of fizzy sugar. Much of the food on board is sourced locally, providing an interesting diet of local fresh produce while injecting some cash into the local economy.